Dedicated Network Supervisor with 23 years of experience combining management and customer service expertise in the Construction side and in the Network side of the business. I work very hard at my job and I would like the opportunity to further my career here at Comcast. Manage 11 Network Techs, permute and maintain team work. Manage and inventory all Node Split projects for Network. Establish work procedures or schedules and keep track of the daily work for 11 Network Techs. Manage projects and help with training for RFOG projects. 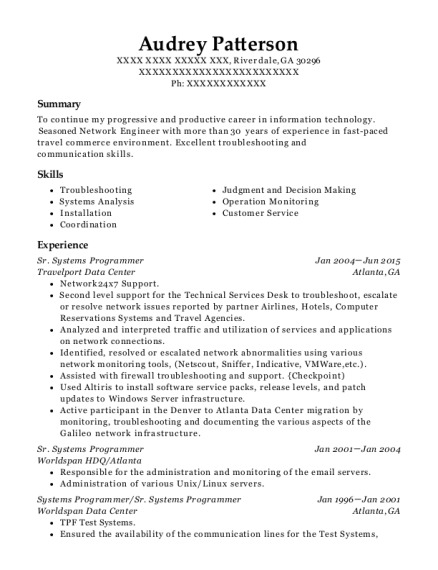 Perform Mid Year and Yearly Reviews for 11 Network Techs. Manage projects such as Mux node cutovers and help with Fiber cutovers, relocations and node activations. Work with and maintain a strong relationship between all departments and Contractors. Ensure safety practices by doing Field Safety Observations for all of 11 Network Techs that I manage. Ensuring proper setup and maintenance of all Engineering practices by doing QC's of all 11 Network Techs that I manage. Work closely with all MPJ Managers, Supervisors and Techs with any issues or practices to ensure a good Customer Experience for our customers. Troubleshooting Downstream, Upstream and Fiber issues in the Headend for Network Techs out in the field. Wired racks for Power and RF for Headend equipment for new and existing designs. Troubleshooting and Installation on CMTS Equipment. Troubleshooting and maintaining the Network. Troubleshooting and maintaining OTN's in our plant. Led and worked on the re-powering project for the Mux area. Led and worked on the FCC Proof of Performance Tests every year. Led and worked on the Mux Architecture upgrade. Troubleshooting and activation of Fiber projects. Overhead and Underground Construction of Coax and Fiber. Trained Network Techs on Construction, Coax, Fiber, Equipment and Troubleshooting practices. On call and Standby for Outages. Developed and maintained and strong relationship between departments and Headend. Support for the MPJ Techs for any plant issues or questions. 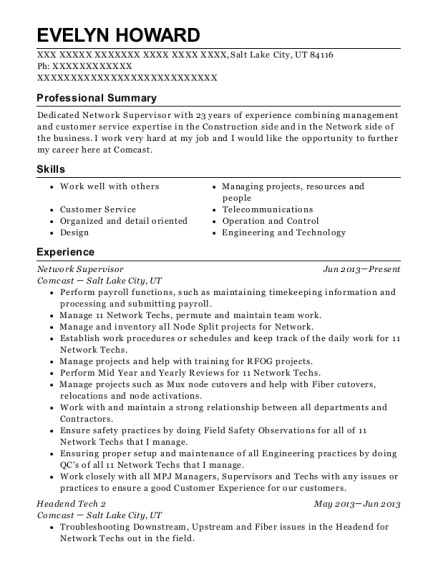 This is a resume for a Network Supervisor in Salt Lake City, Utah with experience working for such companies as Comcast and Comcast. 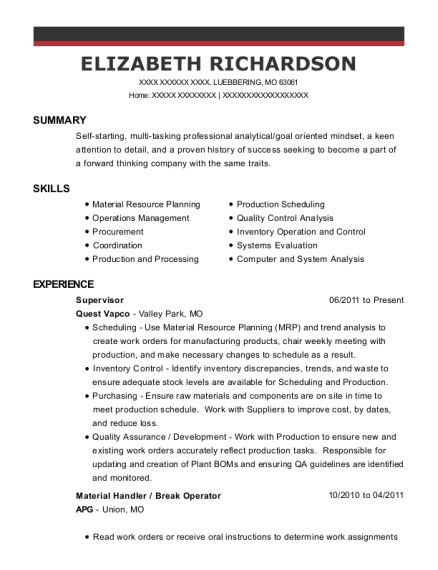 The grade for this resume is 0 and is one of hundreds of Network Supervisor resumes available on our site for free. 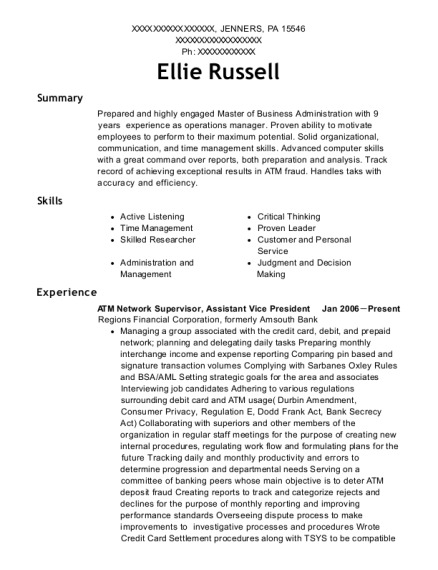 Use these resumes as templates to get help creating the best Network Supervisor resume.